ITS THE BEST EVER!!!!!!!!!!! GO BUY IT!!!!!!!!!!!!!!!! A highly developed, detailed and progressiv aircraft for the advanced flight simer. Very nice made selfinstalling liveries for free download at precisionmanuals.com. Technical support at avsim forum. SidStar support for the FMC. My favorite Airliner today - i really can recommend this PMDG 737 series ! Cons: May work slow sometimes on slow computers, May take all your resources. Panel is good, but quite complicated! It's the best 737 I have ever seen. You need Active Camera [another payware] to see the cool cabin and someplaces in the cockpit view. I only got it today so still learning how to fly it. It is definately worth the money. Just by the looks of it, its a quality addon. It flies nicely and is equipt with nice sounds as well. The only negative aspect of the aircraft, is that it eats up FPS constantly. Great product overall! Nice paints available for free, too. Performance is easily optimized with good use of drivers, tweaks, and fs2k4 settings! the PMDG site offers tips that help, too. Pros: Everything has made an inpact on me, even the magenta bars are so realistic. Cons: You need a medium to high end pc to run it. It comsumes all of your pc resources. Fantasic model, I would recomend it to any virtual pilot. It's so realistic with a fully functional FMC and glass cockpit, there's hardly any knobs or switches that can't be turned off or on. And with the 737-600/700 models and liveries what more could you ask for?. 10/10 from me and a big from me. 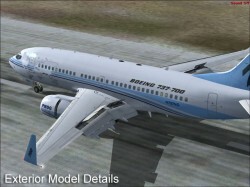 The PMDG 737NG is an outstanding aircfraft. You can fly it with all real-life procedures including SID's and STAR's. Or you can just fly and enjoy the fantastic model.